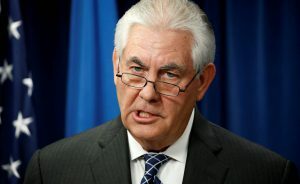 Secretary of State Rex Tillerson stated Tuesday afternoon regarding Venezuela: “We are evaluating all of our policy options as to what can we do to create a change of conditions where either [President of Venezuela Nicolas] Maduro decides he doesn’t have a future and wants to leave of his own accord or we can return the government processes back to their constitution.” See video. Scott is with the National Lawyers Guild Task Force on the Americas. She questions the legality of U.S. sanctions as well as funding of opposition groups in Venezuela and elsewhere. Kovalik is author of the just-released book The Plot to Scapegoat Russia: How the CIA and the Deep State Have Conspired to Vilify Russia. He teaches international human rights at the University of Pittsburgh School of Law. He was just in Venezuela and contrasts focusing on any possible allegation regarding Russian interference in the 2016 U.S. election, while the U.S. government is openly getting away with interfering in Venezuela and elsewhere.